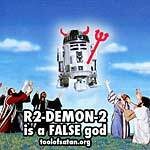 The Force is a Tool of Satan - Episode III ALERT! CALL US NOW AND GIVE US YOUR SUPPORT! 610-980-5705 - WE WILL POST THE BEST MESSAGES! In this “Final Episode” of the Star Wars, EVIL triumphs using the Force - a greater force they claim than God! This is a Dangerous LIE! This is no mindless entertainment, but an attempt by DEMONS to distract you from your real 75 year mission on planet Earth, to give yourself to Jesus! Do not trust a Yodah puppet from Satan’s dream factory, trust in the Word of the Bible! Since 1999 we warned that the end times will be upon us with THE SEVENTH SEQUEL  and that time is now. Do you have a collection of the Star Wars figures and idols? Do you watch the Star Wars- religiously? No Force can help you, White side or Black. Armies fight Babylon, the towers exploded - the battle of Armageddon is soon, but you must decide! Turn your back on fantasy movies and give yourself to the only real faith  the truth of JESUS. Christians REJOICE! Jesus will lead us in a real star war - between the armies of Heaven and Satan. Believers will “beam” up to the Starship in the sky, and Captain Jesus shall lead a thousand year Federation of Planets before Judgment Day. We are destined to WIN! When you stand before Jesus’ throne what will you say you believe in the power of the Lord, or the power of the Force? Science fiction fans repent. Your very eternal SOUL depends on your answer. The Morality Players - Coming Soon to L.A. when the Morality Players perform the works of JACK CHICK on August 19-21 2005  The only entertainment in Hollywood that saves your eternal soul Guaranteed! Read earlier tracts. Films also available. Our Executive Board AND The Morality Players are happy to spread His word on your Radio, Television, Internet, or Print publication. Please send us an E-mail. *image above available as a t-shirt for a limited time! Many write, "you are just doing this for money because of the ads and merchandising." They are WRONG! We do not seek your "donations" (although they are welcome) but are SPREADING the WORD - and at resonable rates! If you purchase any of the items below, ask us, and we will e-mail you Wall Paper Sized images of the art above as a token of appreciation! 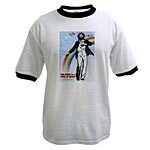 New Color Jesus shirts available in all sizes! Impress the holy and the heathen alike! Hang this anti-Star Wars Lord in your living room! An 11x17 poster can liven up your church, office or meeting hall for only $5.99 including shipping. 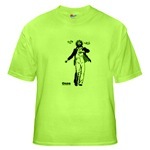 From Café Press comes this fine lime green Dancing Jesus T-shirt in all adult sizes. Is that Jesus in your pants, or are you just happy to Praise the Lord? 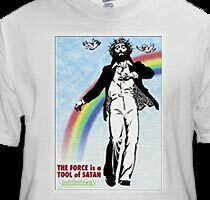 Wear His Full-Color Glory on this fashionable ringed shirt and let people know they need to Beware of Star Wars! SEE US ON YouTube Spreading the Word!